 Log In needed $589,900 · Stunning West Coast Style Build w/Two Bedroom Legal Suite! This brand new 5 bedroom, 3 bathroom single family home currently under construction is being built by Breitray Developments with a completion date of April 2019. 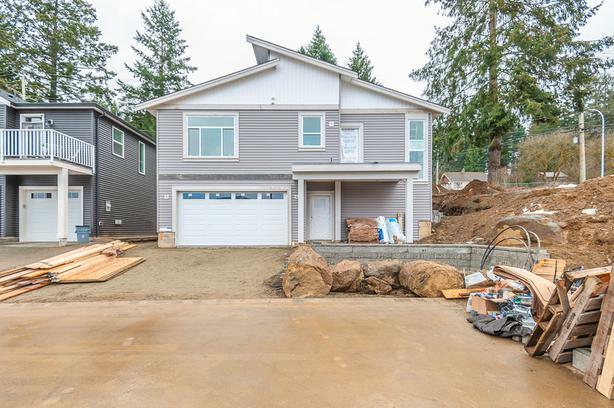 Located in south Nanaimo, this home will feature high end laminate flooring throughout, a spacious open concept living room with gas fireplace, a kitchen with quartz counter tops, a great room, and a south facing deck. The master bedroom will have a walk-in closet and ensuite. There will be two other bedrooms, a 3-piece bathroom, and a laundry room all on the upstairs level. Downstairs will have a den/office space and the double garage. The two bedroom legal suite will feature a separate entrance and separate laundry. This makes it perfect for an income booster or for your university student children. Landscaping and retaining wall will be included. Measurements are approximate, please verify if important.